Austrian Agricultural Cluster experts accompany your project with customer-focused advice and services, training and transfer of know-how. The Division of Agricultural Engineering at the University of Natural Resources and Life Sciences Vienna is engaged in research and teaching. Our objective is to develop innovation based on the sustainability by means of inclusion of “high-tech” agricultural methods. Our young and interdisciplinary team transfers the scientific competence in cooperation with industry, counseling and practical experience. The International Competence Center for Cattle Breeding and Dairy Cattle is an association focusing on education and practical training in cattle production and milk processing. Since its foundation in 1996, WIESER CONSULT GmbH has developed into a successful consulting company and a reliable partner for agriculture, food processing and bioenergy projects in emerging and growing markets. WIESER CONSULT INTERNATIONAL is operating local offices in Eastern and South Eastern Europe and working together closely with acknowledged private and public partners. Having questions and would like to know more? Would you like a reliable and experienced partner on a project? 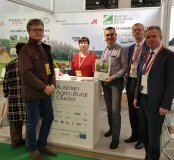 AAC participated in the 9th edition of the exhibition Agro Animal Show in Kiev. The fair took place on 19 – 21 of February 2019. AAC presented complete solutions for animal breeding, agricultural technology and the food processing industry. 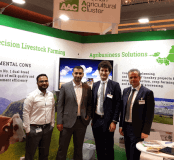 AAC exhibited at the the first United Arab Emirates (UAE) international exhibition on agricultural investments in Abu Dhabi.